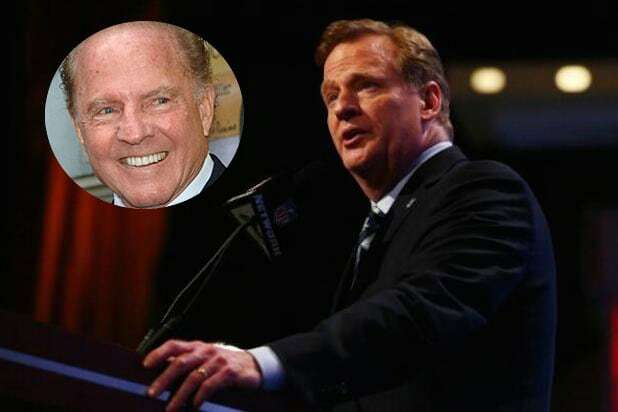 NFL commissioner Roger Goodell defended the league’s health and safety efforts Wednesday following the revelation that Hall of Famer Frank Gifford suffered from concussion-related brain disease Chronic Traumatic Encephalopathy (CTE). Gifford died earlier this year and his family announced the results earlier Wednesday of a test conducted on his brain after his death, which confirmed their suspicion that he suffered from CTE — a progressive degenerative brain disease often linked to concussions suffered by football players. “We appreciate the Gifford family’s desire to help the medical community understand more about CTE, and we are grateful for their support of the league’s efforts to improve safety in our game,” Goodell said in his statement. Frank Gifford was a beloved member of the NFL family. He exemplified everything good about our game throughout his 85 years of extraordinary accomplishments, both on and off the field. We appreciate the Gifford family’s desire to help the medical community understand more about CTE, and we are grateful for their support of the league’s efforts to improve safety in our game. At the NFL, we are supporting grants to NIH and Boston University as well as other independent efforts to research the effects of repetitive head trauma. But we are not waiting until science provides all of the answers. We are working now to improve the safety of our game. The NFL has made numerous rules changes to the game, all to enhance player health and safety at all levels of football. These include 39 rule changes and better training and practice protocols that are yielding measurable results. This work will continue as the health and safety of our players remains our highest priority. We have more work to do — work that honors great men like Frank Gifford. ...and a frozen fan or two, even if the Meadowlands aren't technically the Frozen Tundra of Green Bay, Wisc. The rest of the Manning family will be on hand to root for Broncos QB Peyton. That includes New York Giants QB Eli (whose team did not make it to the playoffs this year) and quarterback legend dad Archie Manning. Comedian Joel McHale is a proud Seahawks fan, and he said on "The Ellen DeGeneres Show" last week that he'll be on hand to root for the team come hell or high water -- or even snow. Film mogul Harvey Weinstein is also expected at the game. Seahawks fullback Derrick Coleman is deaf, but that hasn't stopped him from fulfilling his dreams of playing pro football. Now he's in the Super Bowl -- and has one of the most heartwarming stories to boot. Fresh off her Grammy appearance last Sunday, Queen Latifah will sing "America the Beautiful" before kickoff on Sunday. Opera singer Renee Fleming will also sing before the game, in her case the National Anthem. Here she is singing for the president at the National Christmas Tree lighting ceremony in December. Of course, you can't miss Pepsi Halftime performer Bruno Mars. Special guests Red Hot Chili Peppers also promise to give an amazing performance ... let's just hope they wear more than socks. Seahawks cornerback Richard Sherman made headlines at the AFC Championship Game on Jan. 19 for the feisty interview he gave after the game. See if all that talk was for show or for real on Sunday. Though the Sea Gals and Denver Broncos Cheerleaders will probably be wearing a lot more than this on Super Bowl Sunday, they still promise to give one heck of a show. If you’re one of the millions of Americans who will be tuning in to the Super Bowl but can’t name a player on either side, this guide is for you.